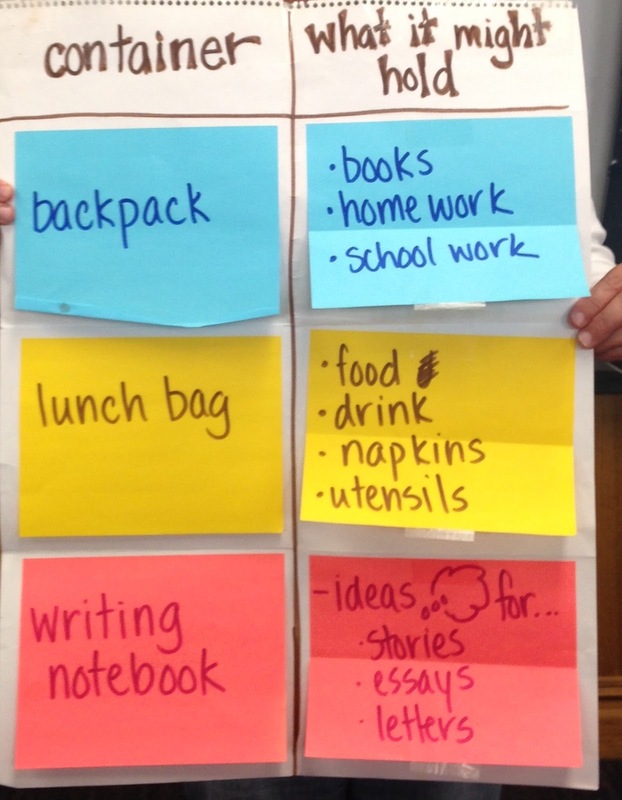 TCRWP Oct. 17, 2015 Saturday Reunion – Another magical day of learning at Teachers College. So glad I went and that four colleagues tagged along on the early morning train ride up and back. Here are some of my highlights, seen through the lens of a 3rd grade teacher who wants to get better at teaching an information writing unit and get better at teaching reading workshop. She stopped at the beginning to have us state what we think about the character. She reminded us of the teaching point “to delay judgement” as we continued to watch. * Pick a topic close to your heart, stuff you know. Start broad as it is easier. * ONCE the table of content is set, draft chapter by chapter, the chapter you know the best FIRST. * As he students draft, teach a revision mini-lesson each day. Remind them on day 2 of revision that they need to go back and revise the chapter from yesterday and today based on today’s teaching point and continue this process during revision. * Transition words glue it together from part to part. *Use prompts to say more: The important thing about ___ is ___, People may wonder ___. This connects to ___. This makes me wonder ___. *Then teach how to write an introduction (it should hint at the central idea) and an ending. * Include text features that accentuate the main idea of your writing. She started by reading-aloud a part from a few nonfiction texts and her enthusiasm for this genre came through. Honestly, nonfiction has NEVER been my favorite but Shana’s passion came through and made me realize I need to do the same when I teach informational writing. Amazingly, as my partner and I read and reread what, at first, seemed like a really boring scientific animal article, it suddenly was more interesting and we came to appreciate the beautifully crafted text. 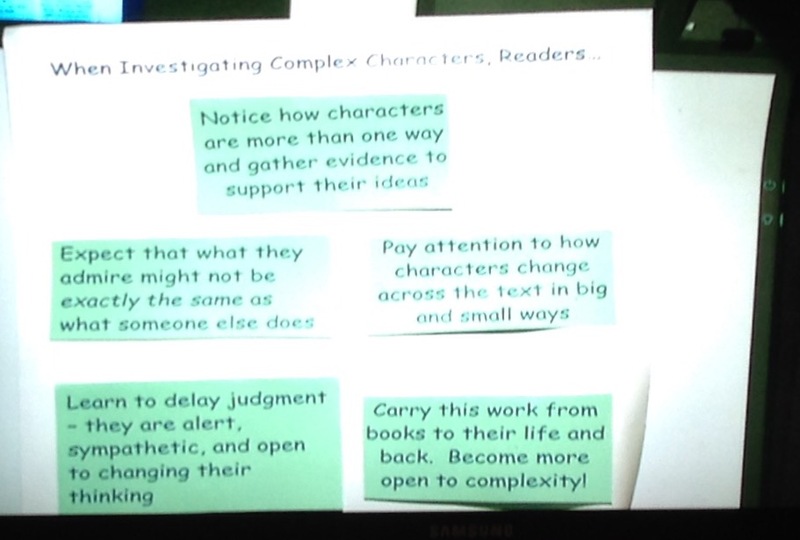 Studying the mentor text helped me to like this kind of writing more. * Do you care about the topic? * Can you create a table of contents and fill it in? * Do I have 1 or 2 resources to turn to to add to what I already know? Instead, help them to understand the idea of using CONTAINERS. Then she said: Writers have containers, too. They call them STRUCTURES. The text structure holds the information. The text structure helps readers to hold onto the information s they read it. Writers think of the best way to convey the information and then pick the best structure. Then she showed how she wrote about READING ON THE SUBWAY as boxes and bullets, as compare/contracts and as problem/solution. 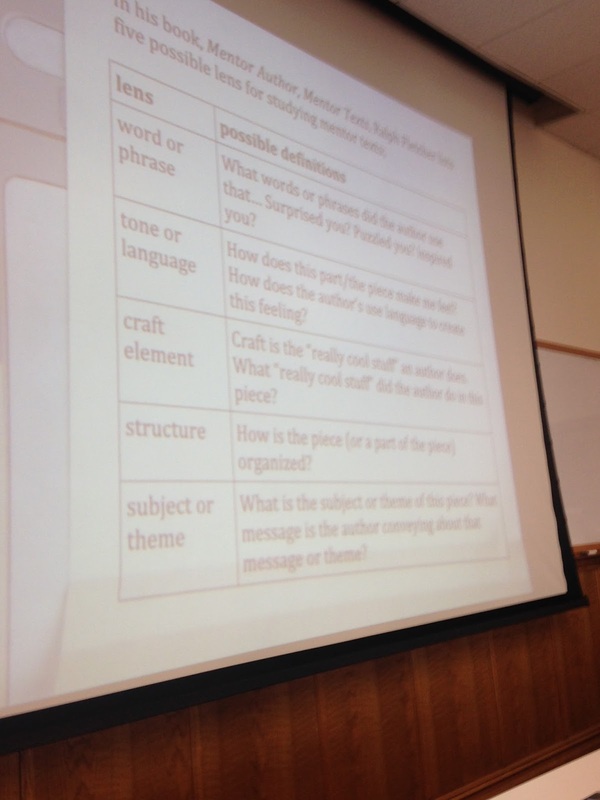 She suggested we try to write about one topic using MANY structures and to give our students the same practice. She showed the Pathway Development Checklists for 3rd grade and then for 4th Informational Writing and 4th was SO much longer. It is a BIG JUMP. They really need LOTS of practice. By having the charts up all year, the kids will start to understand that the KIND of writing might change, but all writing has a STRUCTURE, gets DEVELOPED and follows WRITING CONVENTIONS. Kristine went through step-by-step how to use Book Two and the online resources. Now I am set to teach a very powerful reading unit to my students. I love the new Reading Units of Study!! It was such a pleasure to learn from Ryan. Years ago I met him when we were in the same advanced session during a Summer Institute. Now he is a staff developer!! I learned LOTS – thanks Ryan! Using the generating strategy of turning points, he got me to write a story about the first time I read during a church service. Then he got my partner and I to evenly take turns to help each other write better. As a place to get ideas for how to compliment a writer, he suggested delivering an inquiry lesson with students by reading the quotes on the back of a book – a book blurb. What do you notice other literary publishers so when they give a compliment? 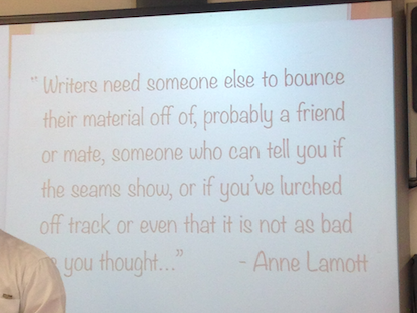 Try saying that about your partner’s writing as a compliment! She reminded the standing room only Riverside church that OUR expectations are our kids’ ceilings. She reminded me to teach with confidence and let the kids surprise me! And she reminded us that we feel bigger in the company of others who are trying to grow. She reminded us to BE STAR MAKERS! 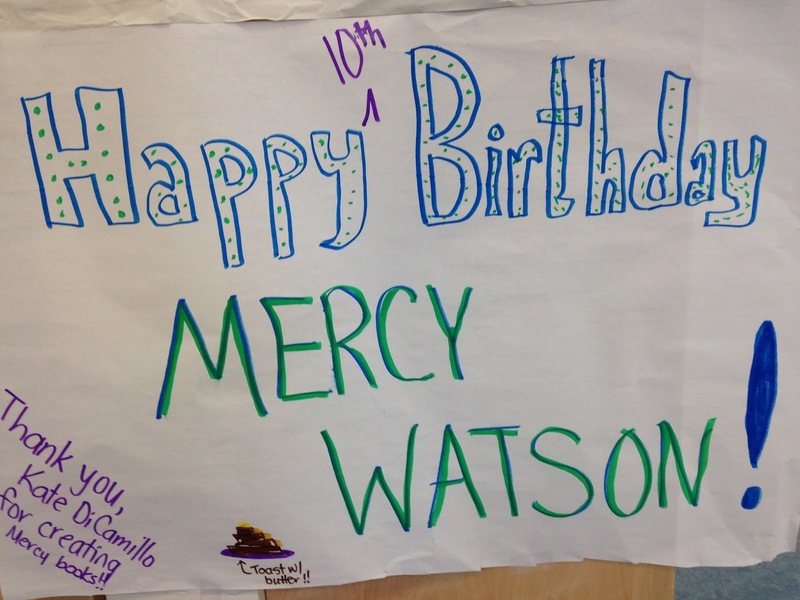 Kate DiCamillo on Mercy Watson’s 10th Birthday! 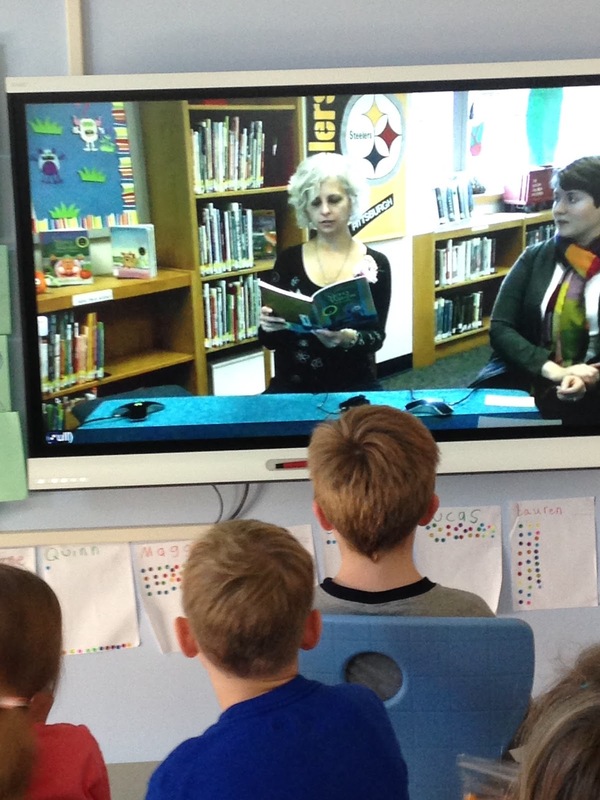 On Thursday, October 15, 2015 my 3rd graders and I thoroughly enjoyed celebrating Mercy Watson’s 10th Birthday by watching a live-broadcast of author, Kate DiCamillo. Thanks to the Pittsburgh Arts & Lectures, we registered to watch the broadcast. A few days before, we emailed our questions. 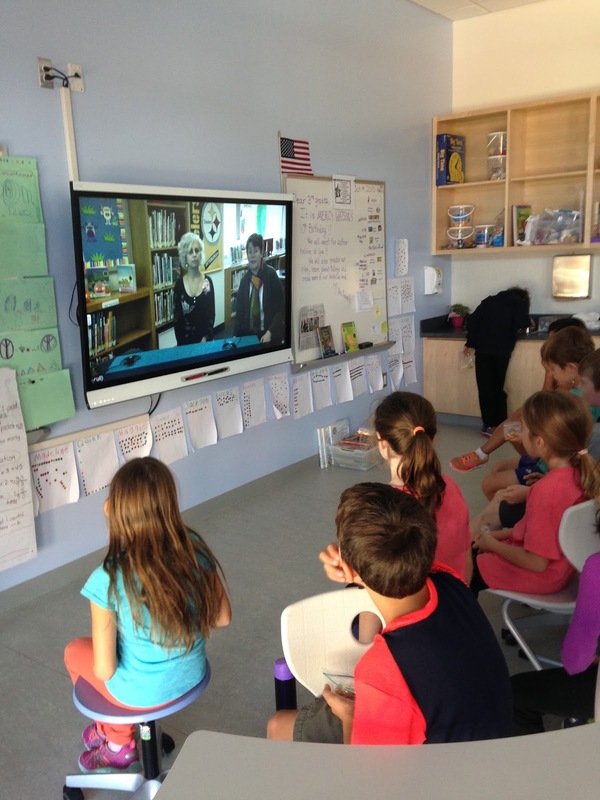 Then at 1pm EST, we joined students all around the globe to listen to Kate talk about the Mercy character she created and her writing process. Definitely my students favorite part was when the moderator said, “Students at Discovery ES in Virginia want to know why the Watsons always call the fire department and Eugenia always calls the Police Department?” Cheers erupted because our question was being asked. Kate said: “I like the idea that you can always ask for help so I include that in these stories.” A nice thought! Class watching Kate on the Smart Panel. Kate reading aloud to us. 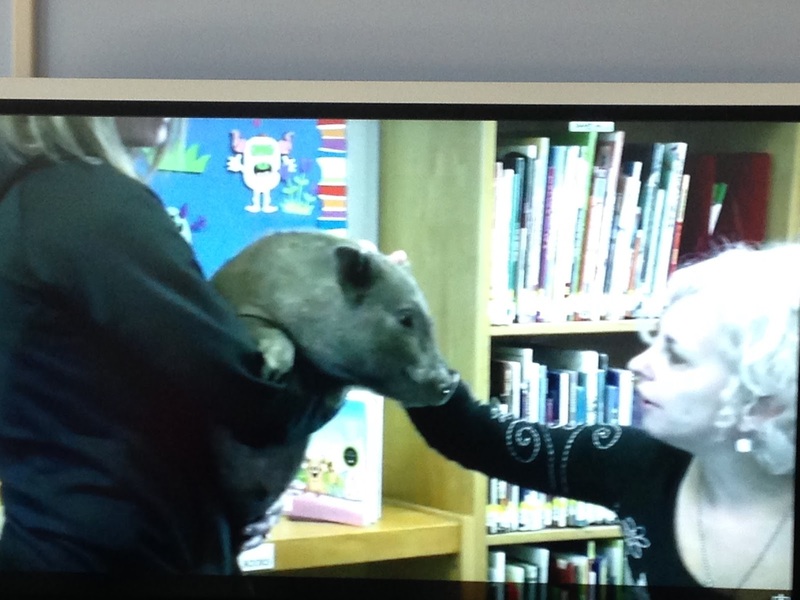 Kate meeting a real pig at the end of the live broadcast!! * She published her first book, Because of Winn Dixie, at age 36. Now she is 51 and has published a total of 31 books. She has 4 more in the works with a new novel coming out in April. * Her typical day as a writer is to get up at 5:30am, get a cup of coffee from the automatic coffee maker and write 2 pages. Every day – 2 pages. * As a child, she was sick a lot and she spent LOTS of time reading books and imagining stories. * She admitted that writing is a very solitary activity. However, she does have a community of writing friends that gives her feedback and tells her if her stories make sense. * She got the idea of making Mercy’s favorite food toast with butter the day she drove her friend to the airport using her brand new car and her friend got into the car with toast with butter and proceeded to tell her how great this food is. * Of all the characters she has written, she admits that Sistine Bailey and Flora are the two most like her. * She always has a small moleskin notebook with her to jot down ideas. * she travels to “fill her well” and discover new ideas to write about. * New York City is a favorite place to travel because she can walk 3 blocks and get so many writing ideas. * She does not believe in “writer’s block”. Instead, she feels there are good writing days and bad writing days. But no matter what, you need to show up and write. That’s why she writes 2 pages a day, every day. * Advise for budding writers – READ LOTS and Don’t give up. She had 6 years of rejection letters.